I was given a wonderful opportunity by our President and CEO to introduce horticultural therapy at Ohio’s Hospice of Dayton. I was excited about the opportunity, but well aware of the barriers I faced. The average stay for our patients is only a matter of days, and many patients are not able to participate in activities. 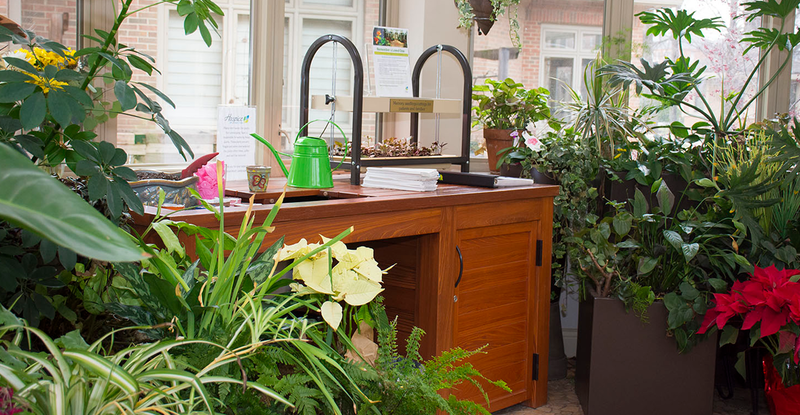 It finally came to me to create opportunities for patients and their families to enjoy horticultural therapy as a way to extend their connection beyond their hospice stay. Ohio’s Hospice of Dayton is fortunate to have a solarium for our patients and families to enjoy year around. 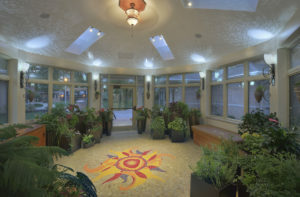 Our unique octagon shaped solarium is filled with plants and is designed to comfortably accommodate wheelchairs, patient beds and families. There is a sitting bench which houses our water supply and a planting table. On the table there is a small grow light which is filled with plant cuttings, soil, pots and instructions for planting so families can take a plant home in memory of their loved one. We call this a Love Story Garden. Effortless plants such as Jade, Wandering Jew and Cuban Oregano are just some of the plant choices provided. 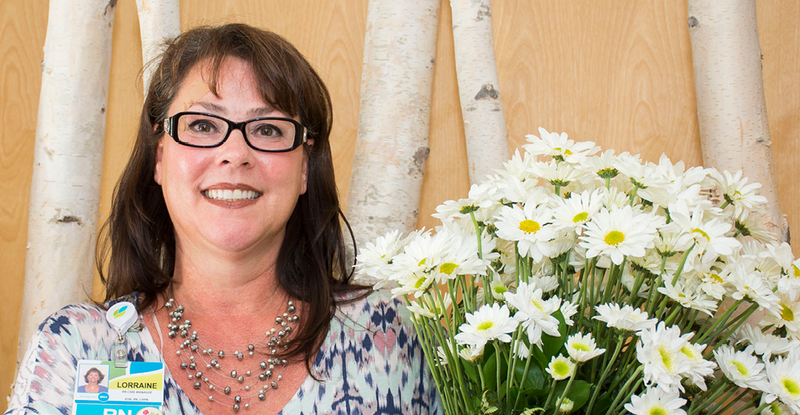 However, we try to accommodate the wishes of patients and families for any plant they might request. When the project started we began with a donation of 2000 black plastic 3” pots. Although this donation was much appreciated, we wanted to come up with something that would serve as a meaningful and attractive keepsake. I brought a hand full of pots home and painted them with acrylic paints. Patients and families loved them. They were a huge hit. The only problem was they were flying out the door faster than we could get them painted. Thank goodness for our volunteer department. Now many of our volunteer groups choose to paint pots as their project. One teen that had lost her grandmother decided to celebrate her 16th birthday party by involving her friends and volunteering to paint pots in honor of her grandmother. The volunteers are greatly comforted knowing those traveling the journey of loss will benefit from the gifts they created. The plastic pots have been replaced with peat pots for the planting. Approximately 5000 pots have been planted in just under three years. Most family members take their pots home but some mornings I arrive to find potted plants placed all around the solarium. I hope the plantings helped them through their time of loss. There is also a journal in the solarium for people to write in. Families thank our organization with heartfelt words, and leave moving memorials to their loved ones. Our solarium is so full of life and beauty. It is a constant reminder of the beauty and cyclical nature of life. Hospice of Dayton provides many opportunities for patients and their families to connect with nature. Each patient room has floor to ceiling windows with beautiful gardens, ponds and bird feeders to view. A variety of wildlife visit our gardens such as squirrels, chipmunks and ducks. Deer will sometimes venture close enough to feast on our Hosta and fruit from the trees. I believe seeing a deer or chipmunk outside your window to help celebrate your life must be an awesome feeling. I will continue to plant more Hosta as necessary so we can continue to welcome all visitors to enjoy our campus. 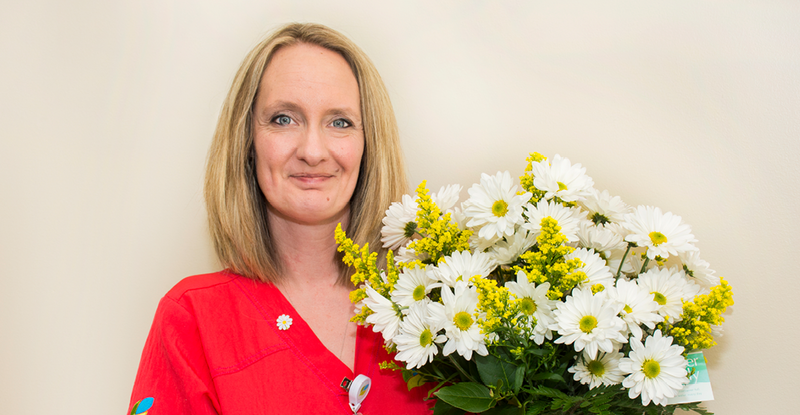 Horticultural therapy is part of our holistic approach to hospice care. It’s important to me that we encourage people to connect with nature because it can be that source of inspiration, hope and healing that people need the most.